What does a guy from New Hampshire know about Texas BBQ anyway? At least that is how Chad Devine begins his SlowpokeBBQ.com site. He has concocted an apple based BBQ sauce that he feels really represents Texas BBQ sauce. Did he get it done? Let’s find out! 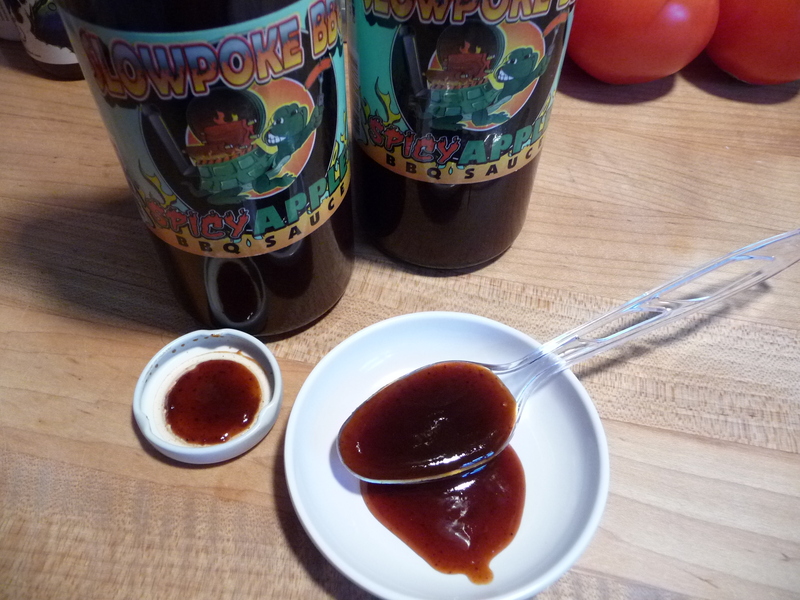 Read on as Marilyn and I discuss our impressions of Slowpoke BBQ’s Spicy Apple BBQ Sauce. Brian: This is a thin BBQ sauces. As Marilyn says, it is of a dark color, with tons of flecks of seasonings. 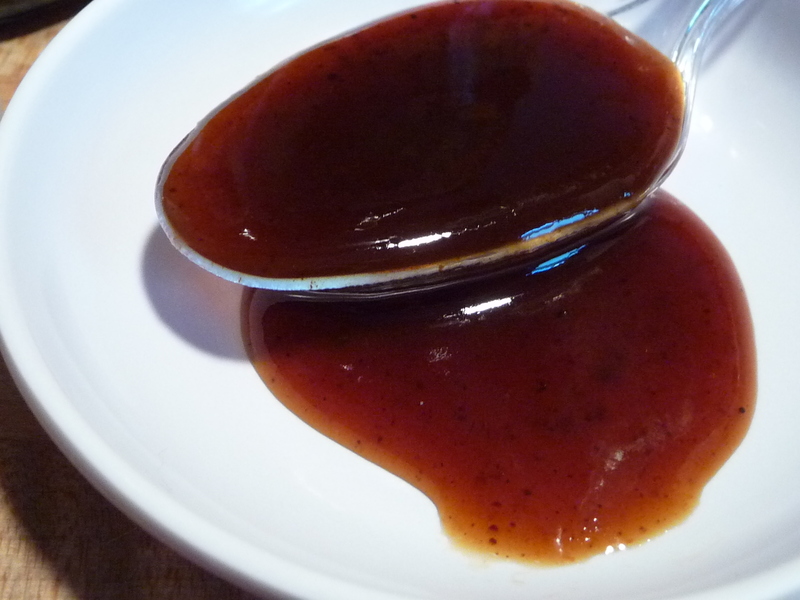 This is a sauce that you would paint onto meat very close to the end of grilling. Also, it might be best used as a marinade before grilling. Since we are only using it on pulled pork for this review, I can’t verify that technique. I do think it is so very thin, and lacking of any body or substance, it may be disappointing. Marilyn: It’s very slick looking with a dark red color. There are lots of bits of seasonings in here. It smells of apple butter with vinegar. A lot of cinnamon smell too. Marilyn: I love the smell. It reminds me of making apple butter at church festivals. First up is a sweet apple butter taste, due to the presence of the cinnamon and apple juice. A slight vinegar tang follows that. Then the heat builds slowly, and continues to build for awhile. Marilyn: Easily a 2 out of 5 in heat. At least I think it is. I’m hoping it goes down a notch or so after cooking with it. This is straight out of the bottle after all. Update: I’m backing off to a 1 on the heat scale after eating it on the sandwich. Brian: Oh, there’s a good spicy hit to this BBQ sauce, but I would put it at 1 out of 5. It’s not hot to me by any means, merely spicy. And I agree, after eating it on the slider, it’s still just a 1 on heat level. Brian: While I agree you know what you are getting here, I would pass by this bottle on a shelf. I don’t think the graphics or label is compelling enough. It just doesn’t look like it has a “mainstream” quality to it. Almost like something you’d see in a local store from a local sauce maker. The main graphic of the turtle that is holding a sausage in a fork, and has a grill on its back, and a smoker vent on its tail is just too crowded for me. I like the fonts used, but this big 12 ounce bottle could sport a much bigger label with better graphics. Marilyn: The graphics are cool and somewhat cartoon-like, but in a good way. 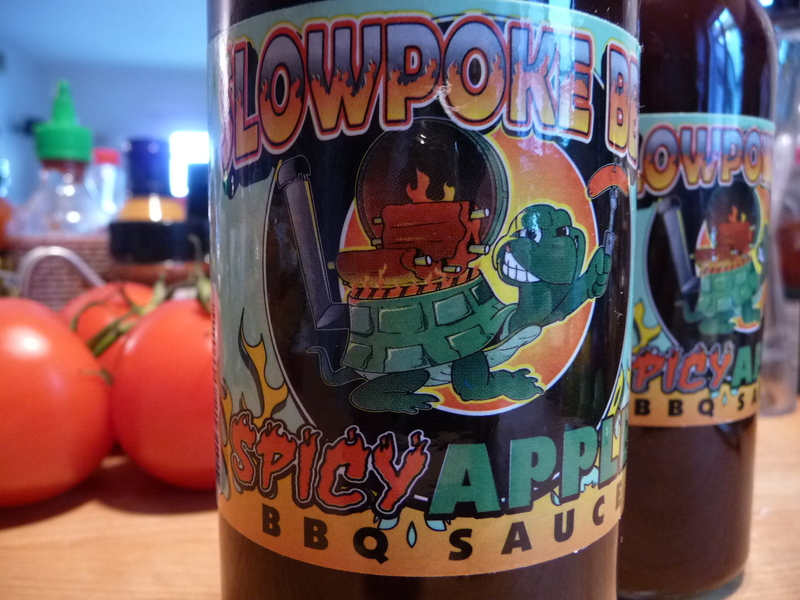 I like the way the colors stand out on the label and the text lets you know exactly what to expect… a spicy apple-based BBQ sauce. Overall Rating (Taste on Food, Final Thoughts): We put this sauce on pulled pork slider sandwiches. 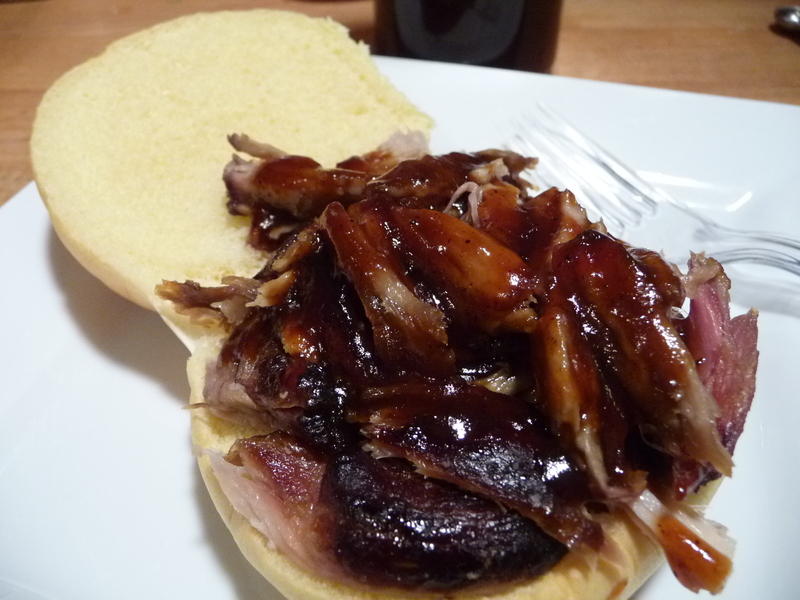 Having some pulled pork on hand from an earlier smoke, we gently heated the sauce and meat together. Brian: I felt the apple and cinnamon was too strong for me, and the tingle of heat at the end did not make up for the fact that is is an overly sweet applesauce sauce with no discernable BBQ sauce qualities. Where’s the smoke? Where’s the tomato or vinegar tang? Too much apple and cinnamon for me, and not enough BBQ sauce. I’ll add my apple flavors with wood, thanks. This is not my opinion of Texas BBQ sauce. Marilyn: I heated the sauce, and then combined it with the pulled pork and re-heated them together. (In my opinion, you have to blend the sauce with the pork… otherwise it doesn’t really give you a good representation of the resulting flavors). The result was an incredibly good finished product! The first bite was mild, with the sweetness of the apple and just a hint of cinnamon. The heat of the sauce was subtle, but definitely noticeable. Though I don’t normally like spicy BBQ sauce, this had a nice warm heat, with a sweet finish that was perfect with the pulled pork. Imagine cooking a pork roast with seasoned apples, add a little habanero powder to the mix, and this is what you’ve got. Kudos! Note: being part German, I grew up with homemade applesauce with pork chops, sliced pork roast, and schnitzel, so this flavor profile was perfect for me. Brian: – I can only muster a 1 star on this sauce. While I could see it appealing to folks that are really into apple and cinnamon in their bbq, I just didn’t care for it. Marilyn: – If you like the combination of pork, apple, and heat, then this is the BBQ sauce for you. I liked it better than I thought but I thought I was going to hate it so “better” is a relative phrase, lol. I thought the turtle was cute but I get what you’re saying as far as it being busy. 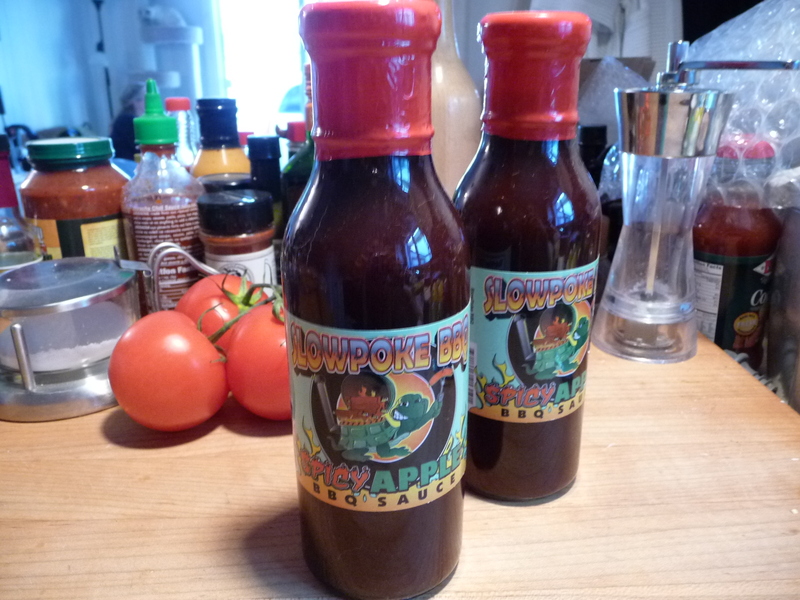 … and the tall bottle really has room for a much taller label, therefore better graphics too. But back to the taste, I’m sorry, but I can’t for the life of me see how this is “Texas ‘style’ BBQ” sauce. Aren’t they all big and bold about pecans down there? Guess there’s a marketing niche for everyone. No offense to Chad. It it a pretty cool marketing device.